A woman died of sepsis weeks after giving birth to her first child by C-section, an inquest concluded. Kimberley Jeffries, 29, from Clacton, Essex, died on 18 April 2018 at Colchester General Hospital days after being readmitted. Her husband Christopher Jeffries, 28, said it was "difficult not to feel angry" at the care she received. 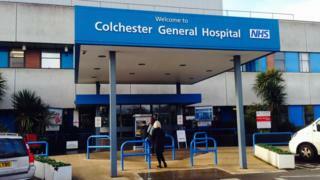 East Suffolk and North Essex NHS Foundation Trust said it had taken "steps to improve treatment of sepsis". Essex Coroner's Court heard the source of the infection had never been found and despite a hysterectomy being performed, Mrs Jeffries died shortly afterwards. Mrs Jeffries gave birth by Caesarean section on 3 April but was readmitted to hospital on 11 April with abdominal pain, before being given antibiotics and discharged. "She could still be alive"
Staff had believed she was likely to be suffering from endometritis but did not diagnose sepsis at the time, the inquest heard. Three days later she was taken to hospital by ambulance with suspected sepsis, and over the next few days received intravenous antibiotics but continued to deteriorate before suffering multiple organ failure. Recording a narrative verdict, coroner Caroline Beasley-Murray said: "The source of infection was never established, and the relevant pathogen was not identified." Her husband described Mrs Jeffries as "the most loving and affectionate wife". He said: "It is difficult not to feel angry that if Kim would have received the care she deserved that she could still be alive. All our family can hope for now is that Kim's death is not in vain and the trust ensures it learns lessons." A report by the trust made several recommendations including maternity staff receiving training to ensure they recognise sepsis. Dr Angela Tillett, interim chief medical officer, said: "We offer our deepest sympathies and condolences to Mrs Jeffries family at this very difficult time. "We have already taken significant steps to improve the recognition and treatment of sepsis in women who are pregnant or who have recently had a baby to make sure the quality of care continually improves."